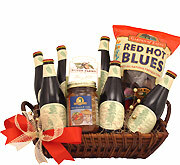 Send this holiday beer gift box to someone who appreciates good beer or who just enjoys experimenting with new flavors. They'll receive holiday beer brewed just for the season from some of the most popular breweries. This includes holiday microbrew from Full Sail, Sierra Nevada, Rogue, Shipyard, Anchor Brewing and New Belgium. It all comes in a cheerful gift box that will put a smile on the face of every recipient. If you know someone going through hard times, this is a great way to give them a moment of cheer. When you can't make it back home for the holidays, this box will fill your spot at the table. If you're simply in the mood to remember special memories, share this box of brew with someone who was there in the moment with you. Cheers to you and everyone you love. This gift was absolutely a great choice, my friend was very happy with this gift. The presentation, the cookies, the beers, everything was really beautiful. I never saw the package it was delivered to CO for my brother-in-law. One of his favorite gifts, he even posted on fb. It was a gift and the recipients loved it! Received on time and recipient loved it.